The International Olympic Committee and television rights negotiations. The major focus of my research involves examining the nexus of sport and commerce, more specifically the evolution of the International Olympic Committee's (IOC) relationship with international television networks. In March 2002, Robert Barney (lead author, University of Western Ontario), Scott Martyn (University of Windsor) and I published a book entitled, Selling the Five Rings: The IOC and the Rise of Olympic Commercialism (Salt Lake City: University of Utah Press, 2002, rev. ed., 2004). I am lead author with these same colleagues on a second collaborative book published in December 2011 by Syracuse University Press entitled, Tarnished Rings: The International Olympic Committee and the Salt Lake City Bid Scandal. I completed a two-year term as President of the North American Society for Sport History (2007-2009), and currently serve on the editorial boards of the Journal of Sport History and the International Journal of the History of Sport. And, while I have a passion for research, there's no place I'd rather be than in the classroom. 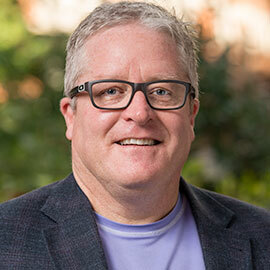 I appreciate the opportunity for interaction with the students in Laurier's Kinesiology and Physical Education program, and I enjoy facilitating opportunities for them to hone their research and writing skills, while providing lectures that help them to place sport and physical activity in historical context. I hold a MA Physical Education (Western University, 1988) and a PhD in Exercise and Sport Science (Penn State University, 1993). Nexus of sport and commerce, specifically in relation to the Olympic Movement. Recently I have begun to explore the financial and logistical challenges of hosting an Olympic festival. Stephen R. Wenn, Robert K. Barney, and Scott G. Martyn, Tarnished Rings: The International Olympic Committee and the Salt Lake City Bid Scandal (Syracuse, NY, Syracuse University Press, 2011). Gerald P. Schaus and Stephen R. Wenn, eds., Onward to the Olympics: Historical Perspectives on the Olympic Games (Waterloo, Ont. : Wilfrid Laurier University Press, 2007). Robert K. Barney, Stephen R. Wenn, and Scott G. Martyn, Selling the Five Rings: The IOC and the Rise of Olympic Commercialism (Salt Lake City: University of Utah Press, 2002, rev.ed.2004).North American Society for Sport History Book Award, 2003. Stephen R. Wenn and Robert K. Barney, “Contemporary Globalization and Recent Olympic Leadership,” in Robert Edelman and Wayne Wilson, eds., The Oxford Handbook of Sport History (New York: Oxford University Press, 2017): 395-414. Stephen R. Wenn, “A Long and Winding Road: IOC/USOC Relations and the Amateur Sports Act,” Olympika: The International Journal of Olympic Studies XXIV (2015): 1-46. Stephen R. Wenn, “Peter Ueberroth’s Legacy: How the 1984 Los Angeles Olympics Changed the Trajectory of the Olympic Movement,” International Journal of the History of Sport 32 (January 2015): 157-171. Stephen R. Wenn, “‘Out with the Old and in with the New’: Jacques Rogge and the European Television Market,” North American Society for Sport History Conference, Winnipeg, Manitoba, May, 2018. Stephen R. Wenn and Robert K. Barney, “‘A Fool’s Bargain’: The IOC, Stan Shefler, and the Intelicense Adventure, 1979-1990,” North American Society for Sport History Conference, California State University Fullerton, Fullerton, CA, May, 2017. Stephen Wenn, “Ethics and Olympism: The Salt Lake City Story,” Sport Ethics Conference: How to Integrate Ethics into Sport Organizations and Companies, Penn State University, State College, PA, April, 2017 [Invited Presentation]. Stephen R. Wenn, “The Cornell Connection Strikes Gold: Robert Kane, Barber Conable and the USOC’s Path to Financial Prosperity,” North American Society for Sport History Conference, Atlanta, Georgia, May, 2016. Stephen R. Wenn, “A Long and Winding Road: IOC/USOC Relations in the Post-Amateur Sports Act Era,” North American Society for Sport History Conference, University of Miami, Miami, FL, May, 2015.